I guarantee you will find “Rosada” on every menu in every bar in Andalucía. You can get it “frito” (deep fried) or á la plancha (gently braised in a persillage of finely chopped parsley and garlic in olive oil). It is a white fish, flaky and juicy like Cod but of denser texture. Anyone who eats it will choose it again. Brits starved of the “fish and chip” experience can slake their nostalgia with Rosada. Like all great classic fishes it is best served plain. But what is it? On the plate it is white, although its name translates as “rosy” or “Pink”. If you haven’t got a clue what this fish is or how to find out, you are not alone. We have seen it translated on menus as “Pollock” (wrong), Hake (wrong) and “Salmon” (ludicrous).
. . . the Spanish “Rosada” (a pretty name applied to fillets of various dogfish). . . .
That’s it. No more information. He doesn’t even suggest you smother it with a “sofrito” (a sort of blokey concoction of tomatoes onions and garlic that he employs whenever the word Mediterranean threatens to border on the foreign). 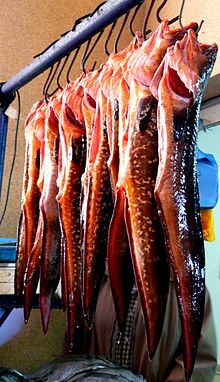 To call a fish “a sort of shark/dogfish” gives rise, of course, to all those Chaz and Dave chip shop English names – Huss, Dutch eel, Rock Salmon. These now join the catalogue of mistakes on badly translated Andalucían “cart” menus. Perhaps Davidson regarded this fish, possibly the most popular lunch in southern Spain, as falling below his culinary pretensions. Or perhaps he felt that the name itself is simply too unspecific and you can’t guarantee what you are going to get. I’d sympathise with that point of view. Oh. It isn’t conger eel either. To hunt down “Rosada” you have to gather what scant clues there are and aim for the Latin name. It’s the only way to pin the damn thing down. So it turns out that this fish, though massively eaten in Spain, is not Spanish at all but from “The Cape”. Spanish Salt Cod, the most eaten fish in Spain, comes from Nova Scotia. Now it turns out that Andalucia’s favourite fish lunch has nothing whatever to do with Spanish fishing or fisheries. Rosada comes from the temperate marine waters of the southern hemisphere, the south African Cape, the waters of Argentina and of Chile, the south Atlantic round Brazil and the waters round New Zealand and South Australia. Rosada in fact, is Kingklip, but this doesn’t reduce the confusing flood of common names associated with it. In Europe it is known as cusk eel; in New Zealand as ling and in South America as congrio or cusk eel. Golden kingklip is also called golden Dorado, golden congrio and the red as pink cusk eel. There are three colours – Golden, Red and Black. The red or “rosy” is considered the best eating and with the best shelf life since the black version with its thin skin goes off quickly. Golden kingklip has skin of orange with brown and golden hues. Red kingklip has darker skin with strong red markings. The white meat is of good quality and firm-textured. The weight of whole fish averages 3-4 kilos (10 pounds). Its scientific names are genypterus blacodes and genypterus chiliensis. The South African variety genypterus capensis was the first to be marketed. They hardly vary except in skin colour. The Rosada has the head of a Pollock with two whisker sensors under the chin, and the body of an eel. The skin is characterised by golden yellow to pink ground colour, overlaid with mottling spots and with irregular dorsal blotches. It hunts between depths of 22 m and 1000 m. feeding mainly on crustaceans like small crabs and scampi. It also preys on fish such as anchovies, sardines and cephalopods. It can be caught throughout the year. The reason it’s not very well known to Spanish fishmongers even though they sell tons of it, is because it arrives on the fishmonger’s slab beheaded, filleted, gutted and skinned. It’s not caught around Spain so the fishermen don’t know what it is either. It is invariably frozen, which is why you can have Rosada and chips seven days a week, but fresh fish only on fishing days. Rosada is sometimes known as a “substitute” for local Merluza (Hake). Rosada is far superior to Hake both in texture and flavour, and freezing doesn’t impair it in the least. In fact modern freezing methods have the fish preserved more or less immediately it’s caught so that so-called “fresh” fish is often considerably older than the frozen. Rosada is a good substitute for any recipe that calls for cod. It is not presently endangered. Its deep water rock habits make it difficult to kill en mass, and it is usually taken “on the side” during expeditions for other fish. Recipes follow! Well, thanx 🙂 The fact is that I think it tastes great, but I could neve figure out what kind of fish it was! Well no one seems to know what it is! Our mistake is to assume its Spanish. Once you realise it isn’t, the path to identification gets really easy. That’s a great article! I’m a little disappointed that it isn’t caught off the coast of Spain as the wife and I were looking forward to going out on the boat and trying to catch some! Oh well! Keep up the great blog! I’m sorry you don’t like it! It’s so fresh it tastes like they freeze it still alive! I know what you mean about Hake though – a great fish! Thank you for demystifying this delicious fish which we’ve been enjoying for a few years, with ali-oli or a swab of garlic/parsley/olive oil. I must admit, pretty it’s not, but tasty, textury and inexpensive it is. It’s true, not even many fish shop owners know much about where it hails from or what it looks like. Kudos for your research. Thanks for your informed comments Alfonso. Rosada is only ugly with its skin and head on. Otherwise it´s the perfect fish! This is a great article! If you’ll give permission I’d really like to publish it in my magazine. How can I contact you? Your Rosada looked delicious! The fried fish was probably merluza (hake). Very nice blog! I am now as unclear as before! Just wanted a clear name for the many people I’ve introduced it to, I’ve gained a dinner table saga. Thank you. Love it just the same! I have lived in Sevilla for most of my life, and rosada is of course available fresh any day but Monday, when there is no fresh fish anywhere. You can buy it frozen, but it’s available fresh all over the country.